Homeschooing high school isn’t as hard as most homeschool moms believe it to be. There are transcripts to consider, but you don’t have to be afraid of those. One thing that is important to remember is that you don’t have to spend a fortune to homeschool your kids — even through high school! There are tons of free high school homeschool curriculum resources available, covering almost every subject you can imagine. You can also find audio, visual, online and eBook options available to work with nearly every learning style! On this site are literally hundreds of courses to choose from, offered by top universities such as Duke, Harvard, Yale, MIT and more. Regardless of the subject you’re searching for, chances are you’ll find it on Coursera. Quick tip: this site features both free and paid options. Type “free courses” in the search box to weed out classes requiring payment. There is an additional option of purchasing a certificate, after completing a no-cost course. Don’t start planning your curriculum calendar until you visit Share My Lesson. This site houses hundreds of really cool high school level lesson plans and a wide variety of subjects. There’s even a section on students with disabilities and gifted and talented learning. There are over 1,000 self-paced courses covering 9 different categories on this site. Many of them provide diplomas or certificates upon course completion. This free online university offers self-paced courses covering nearly every subject. The college credit courses that are available can be used to transfer to some colleges as well. The courses available on this site come from the world’s best universities including Harvard, Berkeley and Georgetown. You’ll find courses for every subject your high schooler will need to cover here. There are over 1,300 online courses from leading universities available on this site. You’ll also find audio and video options as well for your audio/visual learners. You’ll find lesson plans, games, activities and more covering a broad range of subjects for your high schoolers on this site. This site features Algebra, Geometry, History, Science, French and Literature courses and much more to homeschool your high schoolers. There is a course catalog to download that shows what students will complete each of the 4 years of high school by using this free online high school curriculum. You’ll find countless resources to teach every subject in your high school homeschool available on this site. 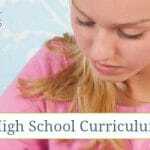 This STEM based curriculum features over 700 lessons and activities to use as part of your high school homeschooling. This site features math lessons for Algebra, Geometry, Trigonometry and more for high schoolers. There are also games that require math that they can play as well. A 9 chapter resource for students that are ready for introductory Algebra. You’ll need to incorporate worksheets based on each lesson to make this a complete math curriculum. This high school personal finance class is covered in 4 books that teach students how to manage money, handle stocks and loans, make a living, plan for retirement and much more. You’ll find complete high school math curriculum for Pre-Algebra, Algebra 1, Geometry and Algebra 2 on this site. Mark Harden’s Artchive is packed with resources covering art and the artists who create it. Whether you’re teaching Expressionism, ancient art, Renaissance art or contemporary art, this site will help you do so. This site features short lessons on various science topics featuring a Q&A after each lesson. You’ll find ourses for Biology, Chemistry, Engineering, Mathematics and more for homeschooling high schoolers on this site. What are your favorite free high school homeschool curriculum and/or resources? First I wanted to compliment you on your lovely tree that you have as a logo, resembling the 4 seasons of the year as in year round homeschooling!! How cool!!! And second, I’m so thankful for these wonderful FREE resources, this may sound redundant but God knows what a blessing it is (and the support I feel as a mom) and to us as a family right now. Thank you! God bless! !